AHA!!! So while my hubby was sound asleep this morning, I snuck off to the flea market!!! Tee hee!!! Oh. Em. Gee. I had time to look through the hoards and hoards of terrible flea market clothing and found some serious sweater gems. The patterns and textures were making me drool. For a buck-a-piece, I got these awesome size large knits. 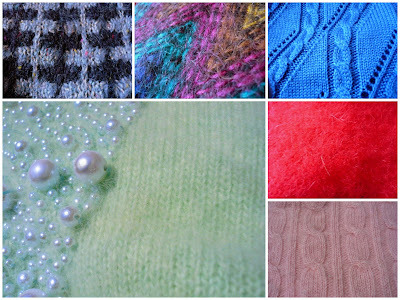 The zig-zaggy colorful one is mohair, the gray/black boxy one and blue cabled one are just acrylic, and the mint w/ pearls, red, and cabled pink are all 40% angora.... SUCH luxury.... They are so flipping huge and soft. I can't wait to make stuffies out of them. I am so pleased.... Seriously! ONE DOLLAR! That's a whole frick of a lot cheaper than buying 3 skeins of lace-weight angora yarn, then taking the 50 years it would take for me to knit it up into fabric. I think I'll make the pink into a piggy, the red into a monster, and the mint into...maybe a baby deer? I'm so psyched about this stuff, seriously. Last, but not least, this generous stack of multi-colored copy paper I found in the book section in a nasty spider-filled box with a bunch of other crap. I asked the dude how much, and he said, "Oh that? Uh...No charge." GOOOOOOOOAL! I have no idea how many sheets it is, but there are 15 different colors, but it proves to me that it's generally worth it to take your sweet time at flea-markets and yard sales, because you can find some seriously epic crap.